The figure shows the trajectory (i.e., the path) of a ball undergoing projectile motion over level ground. The time corresponds to the moment just after the ball is launched from position and . Its launch velocity, also called the initial velocity, is . Two other points along the trajectory are indicated in the figure. One is the moment the ball reaches the peak of its trajectory, at time with velocity . Its position at this moment is denoted by or since it is at its maximum height. The other point, at time with velocity , corresponds to the moment just before the ball strikes the ground on the way back down. At this time its position is , also known as since it is at its maximum horizontal range. 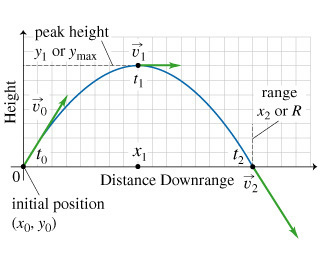 Projectile motion is symmetric about the peak, provided the object lands at the same vertical height from which it was launched, as is the case here. Hence . How do the speeds compare? Here v0 equals v2 by symmetry and both exceed v1. This is because v0 and v2 include vertical speed as well as the constant horizontal speed.